Summary: This tutorial is going to show you a simple way about how to make braided bead necklace out of candy-colored threads and seed beads. I love this beautiful wavy braided bead bracelet! It is shimmering stunner in sunshine. When I figure out how to make this braided bead bracelet, I just can’t wait to share with you. 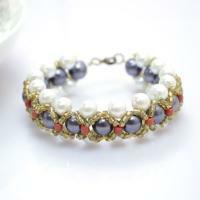 It is a very easy bracelet pattern that you even being a novice can handle it! 5th, attach jump rings and lobster clasp to both ends. Tada! This braided bead bracelet tutorial is done! As you can see, it is really an easy friendship bracelet pattern; what you need to do is just learn one braiding skill and repeat it all along the way.